One of the first places I headed when I arrived in Germany in October was to Bremen and nearby Bremerhaven. I had never been to these cities, but had read about them when researching the lives of several German immigrants who came to Arkansas in the nineteenth century. It was from Bremen that the George Family and Rev. Gustav Klingelhöffer departed in March 1833 for Little Rock as part of the Mainzer Immigration Society seeking to establish a new German state. The journey and the first years in Little Rock were difficult, but the George Family became prominent citizens of the city. Klingelhöffer lived a long life as a farmer in nearby Perry County (see http://www.eclecticatbest.com/2016/11/the-failed-quest-for-new-german-state.html ). Likely, Bremen or Bremerhaven (both are on the Weser River that flows into the North Sea; Bremerhaven is at the mouth of the river about thirty-five miles upriver from Bremen) was the point of embarkation for other Germans who came to Arkansas, including Peter Paul Loetscher and his family (see http://www.eclecticatbest.com/2016/04/the-swiss-vintner-prohibitionist-mayor.html); Philip Dietzgen, a contentious man who edited the Arkansas Staatszeitung (see http://www.eclecticatbest.com/2016/07/the-trouble-is-in-existence-philip.html) ; and Friedrich Kramer, who came to the United States in 1848 and after serving in the U.S. Army settled in Little Rock in 1857. He was a successful merchant who was elected as a Republican to be mayor for a term lasting from late 1873 until 1875; in 1881 he was again elected as mayor, this time as a Demcrat, and held office until 1887. These men and their families were among the nearly eight million Germans who from the late eighteen century into the early 1970s departed from Bremen and Bremerhaven as emigrants. Your understanding of the journey is helped with recorded information that you can access in German or English. In fact, all exhibits and information provided to visitors are bilingual, so English speakers can have the same experience as German speakers. To enhance to the experiential part of the visit, each person entering the museum is assigned the name of German emigrant whose life story unfolds as the trip is made through the museum. The story is told in annotated documents, pictures, and recordings. My assigned person was Richard Morgner (1926-1999), who, I learned, was born and raised in Bremerhaven, had been a German soldier in World War II, and had emigrated with his wife to the United States in 1954, traveling third class with just a few dollars in his pocket. In the U.S., he later became a millionaire. In addition to the emigration experience, visitors have the opportunity to investigate an immigration experience by crossing a hall into an addition to the center that was added in 1912. This part of the experience is set up as a small shopping center from the late 1960s with a hairdresser salon, a used book store, a travel agency, and a department store. 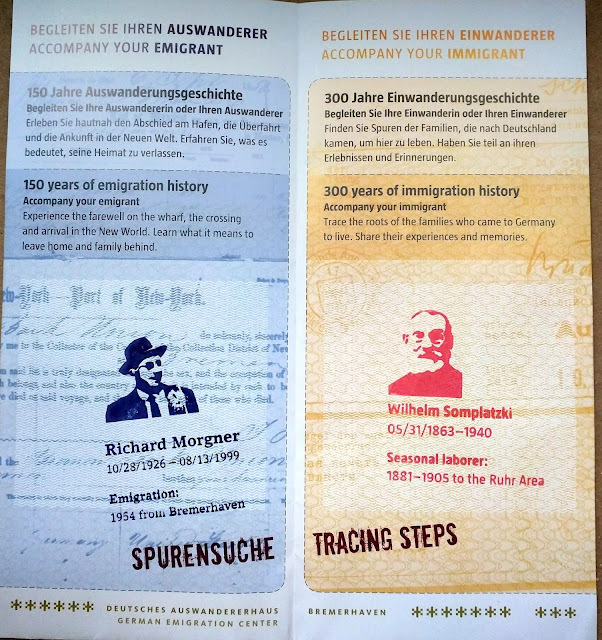 Aside from the fun of looking at realistic old stores, the shopping center plays a role in researching another person assigned on the boarding pass, a person who immigrated into Germany. In my case, this person was Wilhelm Somplatski, a Pole living in East Prussia, who traveled every summer from 1881 to 1910 to work as a coal miner in the Ruhr region. The story of his life, as well as some artifacts from it, are to be found in the “shopping mall.” For example, his picture is in the hairdresser salon and different personal items are in the vintage book store, etc. The experiential element of the museum is engaging and seems especially valuable in making the Auswandererhaus a family museum. When I was there just before noon on a Thursday in late October, it was jam packed. A large portion of the attendees was comprised of families with children, plus a group of teenagers on a school trip made their presence known. The museum is not cheap. The entry price is 13.80 Euros for adults. It is operated by a private company, though its building costs were financed largely by the Bremen and Bremerhaven governments. The museum has some impressive elements. For example, more than a dozen realistic mannequins dressed in 1880s garb stand on a dock in front of the hull of a large ship. They are waiting to board it on a gangplank that is visible. The inside of the ship is realistically depicted, including a view of the roiling ocean through port holes. Also mannequins are shown sleeping and dining in second class. This experiential exhibition, in all, provides a good taste of what it was like to board a ship that would take you away from your home to live in a foreign land. This experience is probably especially poignant for people whose ancestors made the trip. At some point, the museum will likely need to update itself to address the experiences of more recent immigrants. It has recently added a short movie in its immigration section about the movement of Turks into Germany, which started in the late 1960s. At present, about 3 million people of Turkish ancestry live in the country. And, of course, more recently, Germany has been the destination for hundreds of thousands of immigrants from the Middle East and Africa. In a hundred years, their stories will likely inspire the same emotions among their descendants as felt by descendants of earlier emigrants today as they reflect on the emigrant experiences of their ancestors.